This is a simple bolt-on kit. A no-weld, no-drill solution for adding shock absorbers to Casita Travel trailers. 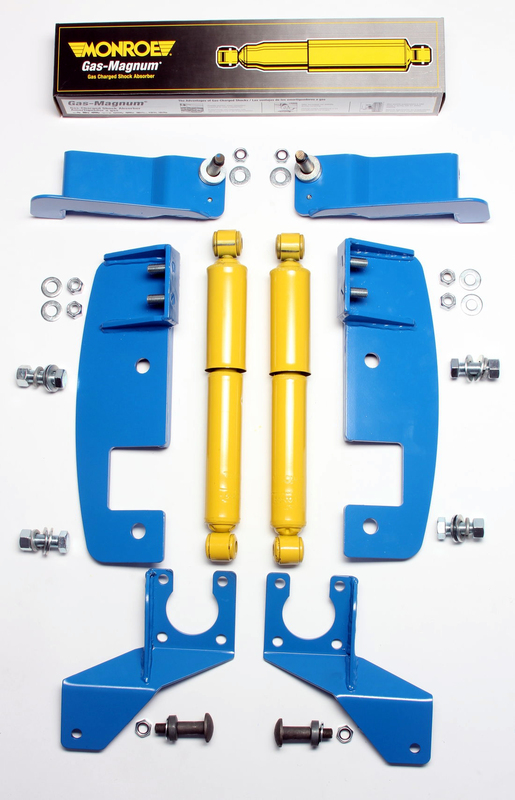 Works for hi-lift (10 degree down) or lo-lift (standard: 10 degree up) axles with or without the Orbital 3" lift kit. 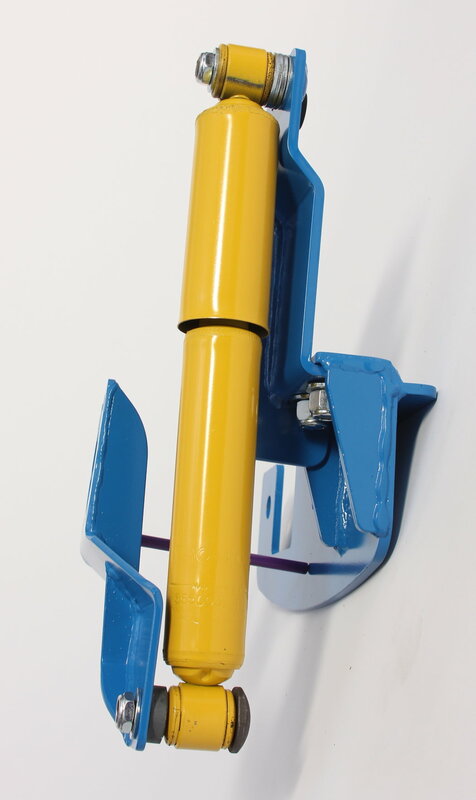 Works for bolted-on or welded-on axles. Please note that this kit does not change the load carrying capacity of your trailer. The inboard brackets are made of sturdy powder coated 1/4" steel plate with welded reinforcements to keep everything lined up. The wheel mount plate is made of powder coated reinforced 3/16" steel plate. 2 Monroe 555003 Gas-Magnum RV Shock Absorbers and all required hardware is included. Q � Do I need shocks absorbers with a torsion axle? ANS � Yes! All sprung vehicles need shock absorbers. Whether called dampers or shock absorbers, they reduce the rebound action inherent in all spring systems. Torsion axles are merely another type of spring system that uses an arm protruding from the sprung axle, in this case, the rubber imbedded in your Dexter axle that creates the spring effect. Q � Why don�t the trailers come with them if they�re needed? ANS � Some trailers do. The other issue is that no one rides in the trailer, and therefore have no idea whatsoever of the bouncing going on inside. Q � What is Dexter�s position on the subject? ANS � They�re all for it. In fact, you can buy a shock absorber kit from them for their standard axles. They don�t make one for the torsion axle but they don�t need to. We invented it. Their executive in charge of the warranty department has made it clear that the OMW shock absorber kit doesn�t affect the warranty. Q- Is it something I can install myself? ANS � If you�re fairly handy with tools it�s no problem. It takes about 30 minutes to an hour. You don�t even need to jack up the trailer. In fact, it makes it easier because you don�t have to come up with a way to keep the axle up against its mounting plate. Do I need to drill any holes? ANS � No! Q � Do the shocks and all of the hardware come with it? Ans � Yes! The shocks and all of the hardware are top grade. The Monroe gas magnum shocks are the best they make. The entire kit weighs 29 lbs. Q - What does a kit consist of? ANS � There are four parts to each side. The axle plate that fits alongside your present axle mount plate. A shock mount tower that fits into the wheel well. A wheel mount plate that fits on the brake plate/spindle on the end of the torsion axle, the shock absorber, and all of the bolts, nuts and washers you�ll need. Q- Will the shock absorber kits fit my particular Casita? ANS � Yes! The shock absorber kits fit all models of the Casita � however � there are two factors that we need to know to be sure you have the right axle mount plate and shock absorber. If you have the high lift axle that Casita specifies and a model made during or after 2006, then your Casita has a bolt on axle. Only rarely did they weld on axles after that. So, previous to 2006 most axles were welded on. Unless someone has changed an axle for you, it�s likely welded to the frame on these models. It requires a kit made for the welded on axles because the mount plate on the axle itself sat inside about a half inch on each side. Therefore, the axle plate for these models comes with a wider tower pad section so the mount for the shock absorber tower will fit correctly into the wheel well. For that reason, we need to know if your axle is bolted on with the two large 5/8� bolts, or if it�s welded on, in which case there will be no bolts involved in bolting it on. Second: we need to know whether you have a high lift axle or a standard non-high lift axle. Here�s how to tell - Jack up either side of your trailer (use the frame, not the axle). Look at the trailing arm of the axle and see if it remains above a horizontal position (above parallel with the frame). If it does, you have a standard axle � not a high lift! If it hangs lower than horizontal you have a high lift axle! That�s it! The high lift axle is a Dexter # 10 torsion axle with a10 degree DOWN torsion arm � The standard axle is also a Dexter #10 torsion axle but with a 10 degree UP torsion arm. This tells us which shock absorber you need. FYI, there�s a 2� of difference in ride height between them. I should also mention that all Casitas have about a 3 foot length of 1.5 inch square steel tubing welded under the 3� C-channel frame, centered at the axle mount area. Some people mistakenly think that this means they have a high lift axle, or that it has been fitted with a �lift kit.� Neither is true. All Casitas have this reinforcement piece in the axle area. In fact, that�s where you should place a jack anytime you need to jack up your trailer. Q- What kind of shocks are in the kit? ANS- The shock absorbers are Monroe�s Gas Magnum shock absorbers. They�re the top of the line in shock absorbers. Q- Do they help? ANS- Undoubtedly! We have filmed the difference on a given course with and without the shock absorbers. We then did the same test with a digital accelerometer inside linked to a computer. The graph shows the physical difference. Just like your car, the difference with and without shock absorbers is dramatic. That�s why every car made in the world has shock absorbers on it. What it didn�t tell us was the noticeable improvement in reducing rebounding side sway when weaving, or when the bumps on each side of a road cause a side to side rocking motion. Q- Does weight have any effect? ANS- Not unless you overload your axle. The Dexter #10 axle used on Casitas is rated for a maximum of 3500 lbs. If you load your trailer with enough stuff to load it to 3600 or more pounds, the torsion arm is bottomed out. It�s solid! You have no suspension at that point. I once weighed a trailer that hit the scales at over 3,800 lbs. For a point of reference, as the designer of our Casita products, my own 17� Casita Spirit Deluxe loaded for the road with full propane tanks is 3025 lbs � and it has every aftermarket part on it that we make, except for the Spare Tire Carrier. I constantly need to remind folks that this isn�t the place to bring your china or ceramic dishes. As avid backpackers, we know that weight adds up very quickly. Choose wisely! If you like to carry more than 3400 lbs I�d suggest you contact Little House Customs (214-202-3191) about replacing your axle with a Dexter #11 axle. You�ll also get better and larger bearings in it as an added benefit. [See our FAQ�s on lubricating axle bearings.] BTW, the scales spoken of are checked regularly by a professional scale service. Q- Will the shock kit affect my warranty? ANS- Once again, NO! Dexter is who warrants your axle. Not Casita. The head of the Dexter warranty department has specifically written that the OMW shock absorber kit does not void the warranty. Little wonder. It improves their product. In fact, they (Dexter) offer a shock absorber kit themselves for their solid axles that are mounted on common sets of leaf springs. However, putting a set of springs would require raising your Casita up so high you�d need extra steps. ** IMPORTANT ** When ordering please choose the correct combination of axle bracket and tower bracket. If you need help deciding what you need, there is more information in our FAQs page.. If you are still unsure please contact us before ordering. Thanks!